In 1970, Plymouth decided that they wanted to get into the NASCAR game. The car their engineers designed for racing was the Plymouth Hemi Superbird, a powerful car that featured a 426 Hemi engine. Also called the Road Runner Superbird because it was built upon the Road Runner, the Hemi Superbird was made as the follow up to the Dodge Charger Daytona, Plymouth's 1969 racecar. However, due to some interesting legal stipulations, Plymouth had to do more than just build a car capable of high speeds in order to enter it in NASCAR competitions. One of the most interesting requirements NASCAR placed on manufacturers was that of homologation. Before it could be certified to participate in NASCAR events, the Hemi Superbird had to meet a number of production requirements. This included being made available for sale to the general public. These cars are generally not made for driving on public roads, which means that the true production models are usually modified a bit-this is allowed to a degree and tends to vary between racing series. According to the rules, at least 500 vehicles had to be manufactured and made available to the general public before the model could be entered in any NASCAR event. Plymouth produced three different models of the Hemi Superbird, each of which featured a different engine. The most common was the Super Commando, which featured 440 cid and 375 horsepower. Then there was the Six Pack engine-440 cid and 390 horsepower. However, the rarest was the 426-cid Hemi V-8. This engine provided a whopping 425 horsepower. Out of the 1,920 Superbirds built by Plymouth to satisfy the homologation requirements, only a reported 93 of them featured the Hemi 426 engine. It is important to note that while many people do agree that only 93 of these cars were produced, that number is not official. Some records show that 135 Superbirds featured a Hemi. It is very possible that the 135 number includes the racing models since they used the Hemi 426 engine. This muscle car was built using the Road Runner body, which means it was a two-door coupe with a standard FR layout and a B-body platform. But while it was based on the Road Runner, it was also modified in a number of ways. The body was smoothed out, and the nosecone was more refined. 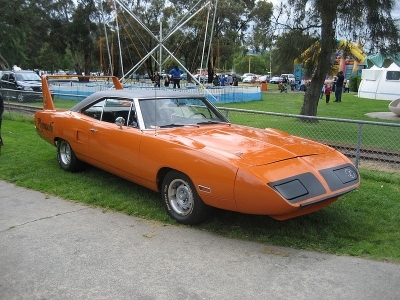 The Superbird's street version featured new retractable headlights that added almost nineteen inches to the overall body length. Vertical struts were added to the back end so that the rear wing could be raised higher, which helped decrease the drag on the car and made it faster. For years, many people believed this height was determined by a closely guarded secret mathematic formula, but it turns out that it really wasn't: the wing was simply elevated so that the trunk could open more easily. One interesting thing to note about the Hemi Superbird is that it was only produced in 1970. That's because more and more emission regulations were going into effect, and these regulations made it difficult or impossible to build cars like this model, which did not meet many of these regulations at all. Another issue was the fact that costs associated with high performance vehicles driven by the public continued to rise, making such collector cars unaffordable for many people. Another issue was NASCAR instituting what was effectively a ban on the aero car model. Aero cars, the nickname given to four different vehicles designed by Ford, Dodge, Plymouth, and Mercury in 1969 and 1970, featured a number of aerodynamic changes to the cars they were based on. These aero cars or Aero Warriors included the 1969 Ford Torino Talladega, the Mercury Cyclone Spoiler II, the Dodge Charger Daytona, and the Hemi Superbird. NASCAR and other racing officials believed these vehicles had an unfair advantage over other cars after they won a number of events in 1969 and 1970. Starting in 1971, NASCAR put new rules into effect that would remove any such advantages the aero cars had. This basically disqualified all of them from racing that year. 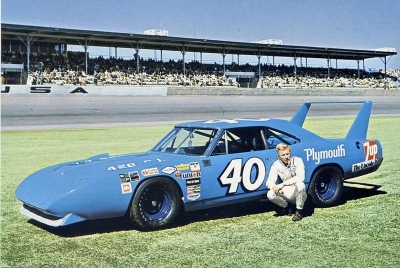 Plymouth did create a new 1971 Superbird prototype that met NASCAR's new regulations, but they determined that it would not be nearly as effective on the racetrack, and they never produced anything other than the first test car. Today, the Plymouth Hemi Superbird is obviously even rarer than ever since some of these classic cars surely haven't been taken care of as well as they should have been. Finding a Superbird is top condition is difficult, but it is not impossible. These vintage cars do come up for sale from time to time on auctions or through private dealers. It is simply a matter of doing some research and being willing to put up the money for one if you do find it. You can reach Matt at Matt@LelandWest.com.